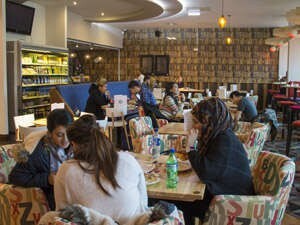 Atmosphere Kitchen and Bar is the central meeting point for Students’ Union members to socialise, make new friends and enjoy a meal or drink at a friendly price. We’re open every day, from 8:30am until late every night with special extended openings for events! Located in University House, overlooking Peel Park and next to the student accomodation, we are the one stop shop for great food, great drinks and great Atmosphere! 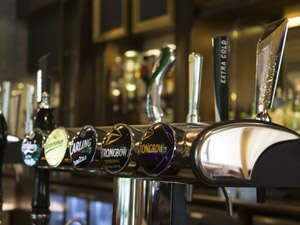 Why not take our virtual tour and have a look around. Our largest space, Atmosphere bar has been through plenty since we first opened it back up in 2014, from big name DJ nights with Danny Howard and Rave of Thrones, to wild student led events and everything in between. 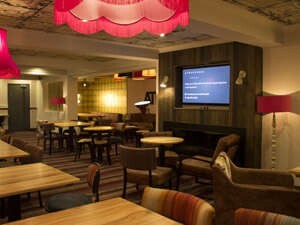 It's home to our weekly events such as our Out of this World Quiz, Karaoke Night and Sky/BT Sports screenings. There are plenty of spots throughout the bar for recharging your gadgets, benches for your laptops and lots of comfy, cosy corners for you to simply unwind. Grab your booth, pick a pizza and settle in for the night here. Our café area is an alcohol free space, separate from our bar. Open for hot drinks, breakfast, sandwiches, meals and just hanging out. You can enjoy a large range of coffee specialties like Frappuccino or Toffee Latte. The café is open until 5pm, and it is bookable after this time for both private and public events. The Lounge is our exclusive area located on the upper level of Atmosphere. Perfect for cosy catchups and smaller events, this area can also be booked for functions and socials. We only source ethical, and where possible, local suppliers. Our NUS buying membership means that all our products are ethically certified and guarantee a solid supply chain that Salford can be proud of. When it comes to our coffee, we mean business too. We have always supported fair-trade and sustainable coffee producers to ensure that farmers receive the fairest of wages, decent working conditions, local sustainability and fair terms of trade for farmers and workers in the developing world. The Fairtrade Foundation licenses the Fairtrade Mark to products which meet internationally recognised standards, so our coffee is not only high quality but also made with love for our customers. We’ve recently moved from a large multi-national product to a smaller local provider to ensure that we are not rewarding those companies who profit from tax evasion loopholes. What you spend with us goes straight back in the Students' Union pot, so we can bring you more by way of events and fun. Your pound actually doubles or triples in value when you buy from us, because not only are you supporting our bar and café, but you’re also supporting our specialist services, funding student reps, supporting sports, activities, events, student jobs and our independent Advice Centre. You won't get that type of local investment from a franchise! We are committed to regular review on pricing and deals to make sure that your student pound is getting as far as it should.